The link that brought you to this page and the page title are a bit of a misnomer, because this short report is not long enough to cover so many chapters of the Bible. What the link and the title do, however, is track where we are in our plan to read through the entire Bible in 1 year. May each report pique your interest and help you to draw near to God. The Bible, James 4:8, tells us if we do so God will draw near to us. Works cited and a screenshot from Bible Gateway are at the end of the report. Internal links provide additional information. ​BIBLE READING—6TH WEEK—LEV 14 – Num 2: Last week’s focus of Leviticus was on the sacrifices. We also looked at a key verse, Leviticus 11:45. As we moved forward this week we recall that the sacrifices and the key verse put our focus squarely on holy living just like this week’s reading’s did while we finished Leviticus and started Numbers. With that in mind, this week’s Short Report recaps holiness in Leviticus and takes a brief look at the Day of Atonement. In its introduction, Leviticus – People’s Bible Commentary states, “The book of Leviticus is valuable because it stresses the life of holiness to which God has called us and which should be our response to the salvation Christ has won for us” (p. 3). It is clear from reading Leviticus that God is calling all of His people for all times to be set apart from sin and worldliness in all of its forms. Accordingly, God established rules for holy living, including the sacrifices, rules for cleanliness and rules for distinguishing between right and wrong, and the feasts that held the people together and kept their focus on God, who often prompts them (and us today) to holiness by declaring, “I am the Lord” (Lev 18:5; 18:6; 18:21), “I am the lord your God (19:4; 20:24; 25:17), and “Be holy for I am holy” (11:44; 11:45; 19:2 ). Although He expects perfection, He is merciful and provides escape through the sacrifices, the scapegoat, and ultimately the cross on Calvary where Christ Jesus is the propitiation for our sins. The scapegoat appears, and then wanders off into the dessert, in Leviticus 16, which provides us with many of the details about the Day of Atonement. It was a busy day for Aaron, the High Priest, who first made “atonement for the Most Holy Place, the Tent of Meeting, and the altar” (16:20, NIV 1984). Next, he placed the sins of Israel on the scapegoat that was led out into the desert and released (vv. 21-22). Two goats were used, the scapegoat was chosen by lot (v. 8). Finally he completed two burnt offerings; one for himself, a bull (v. 11), and one for the community, the second goat, (v. 9; cf. v. 24). 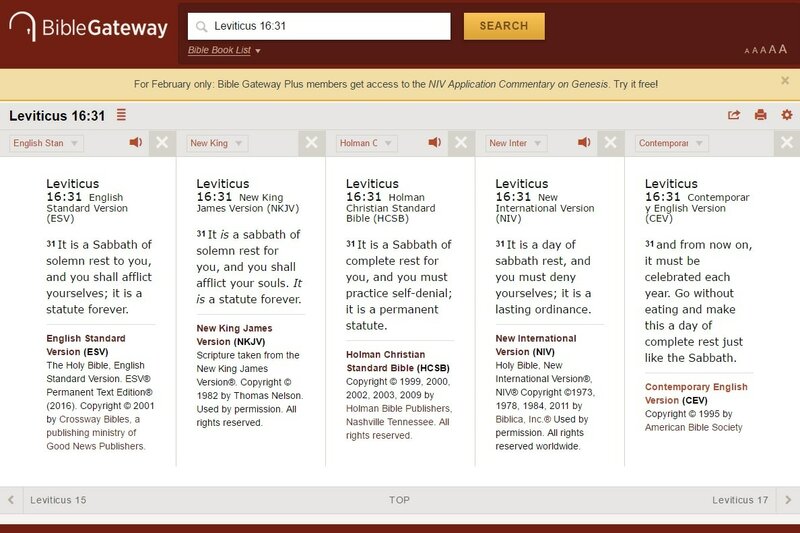 Leviticus – People’s Bible Commentary supports the CEV assessment when it says, “All were to show the genuineness of their repentance by fasting, prayer, self-examination, and refraining from work on this special day” (p. 143). ​Lenz, Mark, J., Leviticus - People's bible Commentary. Concordia Publishing House, 1996.